Is Liam Neeson ready to tie the knot again? 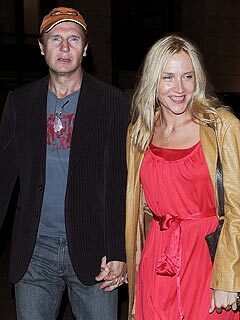 The National Enquirer,says the Irish star will marry his girlfriend PR executive Freya St. Johnston later this year. Neeson's wife Natasha Richardson was killed in a skiing accident in March 2009. A source told the tabloid that Liam was now ready to commit again. The source said: "Liam never imagined he'd get over Natasha's death, let alone fall in love again. "She's been very patient with Liam and never once pressured him to move fast or make any commitments. At this point, they're leaning toward a small ceremony in New York late this year." However, friends of the star are quoted in other outlets saying as saying the story is untrue.